From February 13th to 20th, 6 pupils and 4 members of staff will visit our partnership schools of Nelson Mandela High and Hope Prep in Waterloo, Sierra Leone. The pupils have funded their own visit and the British Council has funded the teachers costs. You can check their progress and see pictures of this trip of a lifetime here. Our journey of a life time has ended, well actually for the girls it has actually just started! Talking to the girls on the flight back to the UK many of them had the same feelings that I had when I returned from my first visit four years ago. They felt that the journey was surreal, the had felt friendships that they had only just made, yet somehow appeared to run deep - to put it simply the connected with people. They also spoke about injustice and how they are struggling to come to terms with the fact the people's lives are so hard. So we are home, much cooler and with family and friends to share photos, stories and memories. Thank you to Mrs Robinson, Miss Smith and Mrs LeRoy - but especially to our pioneering students - Morgan, Cat, Imaan, Corinne, Milly and Katy. I will miss the bus journeys, the meals, the dances, the laughs and of course the visit to 'the local'. See you all on Monday. From Cat and Imaan- Today was an emotional last day. Saying goodbye to the pupils of Nelson Mandela High School proved to be much harder than our already high expectations, but we take comfort in the fact that we have made some great friends. We gave our final gifts and promises of friendship and witnessed an entertaining play organised by some of the kids. The heartfelt 'Goodbye' ceremony was tear-jerking with a speech from Chief John Power, followed by our own opportunity to say a personal farewell to the staff and pupils. We even performed our own A Cappella rendition of 'Lean On Me' which even got the teachers foggy-eyed! We struggled to hold back our own tears as we realised a week of memories would last a lifetime. From Morgan- On our arrival at Hope Preparatory School we were greeted by 322 extremely enthusiastic young pupils screaming our names. During our visit here we have each made strong relationships and bonded with the pupils. Hope once again touched us with their moving songs and joyful children. We had to say goodbye to the adoring and beautiful children who clung to our legs as we reluctantly walked back to the cars. 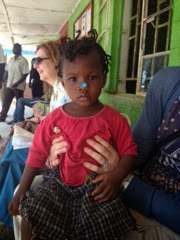 From Katy: Emotions continued to run high as our friend Aminata introduced us to some of the 40 orphans, paid for by the Waterloo Partnership and cared for by her, as she has no children of her own. We were honoured to speak with the children and hear their dreams and aspirations. Our final visit of the day was to Chuckuma Johnson Preparatory School. The children were unbelievably adorable and impressive in their lessons- they were able to answer every one of Cat's maths questions. I met a small boy named Ishabel who was unable to speak, and the teacher informed us that when he first came to the school, he could not interact with the others, but they did not give up and he now enjoys playing with them. The work of Aminata and Chucka school, particularly its dedication to teach and care for all of its pupils, even those who are handicapped show them to be worth support and we hope to help them more in the future. Then the much-discussed Kissy Ferry. All humanity and his/her friends seemed to be on board with all their worldly goods. We were all very hot and sticky, tired and quite emotionally drained after the day's proceedings, but on our way home! Tuesday: written by the staff! Well 18th February is a national holiday - so we didn't get the chance to teach today, but the girls still met some children from Nelson Mandela with Mr Power and Miss Smith. They socialised made new friendships, danced and shared their experiences about the differences in their culture. 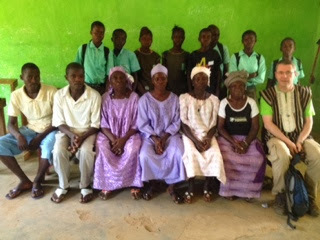 Mr Power met some of the children who would be receiving assistance with their school fees during the next year. 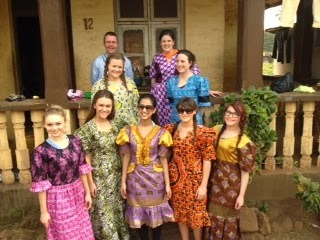 Before that, the girls and staff received their African dresses! The photo says it all- different material, different designs and the delight in the gorgeous colours. We are expecting that a few will be shown in the Sierra Leone Assembly (allegedly they are being worn for the flight home). We also went to see the local health centre which included a maternity ward (which we couldn't go in as someone was giving birth! ), but we saw how they looked after both expectant mothers and ones who had recently given birth. Again a bit challenging emotionally as it wasn't a bit like the clinics in the UK, but pleased we could at least give them some needed pain killers (donated by our staff) and surgical gloves (donated by The Waterloo Partnership UK). They delight and gratitude shown was humbling. 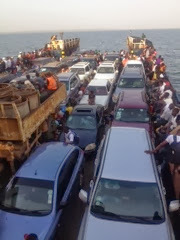 On our way home, one of the drivers, Abu, took us to see his family and home which was local to the hotel in Freetown. He was so proud to show them to us and thrilled that his family could see us, especially as we have shared so much in the 1 to 2 hour journeys we have had both ways each day (for example singing the hits from High School Musical along with the radio as well as our breakfast bars and water). This could be the last post - as head out of Freetown tomorrow evening to cross the Sierra Leone River and an early morning flight to London. There were plenty of tears today and tomorrow's farewells will be hard. So Cat's report from Nelson Mandela: we gave lessons on astronomy, art therapy and poetry to the 14-18 year olds. Corinne taught outside under a mango tree and allowed her students to express their feelings through art, whist Katy and I taught in the brand new buildings (which we funded) which was a real honour (The reports to our teachers states the staff at Nelson Mandela were hugely impressed). The lessons started slowly but then were enjoyed by all and very successful. Morgan at Hope reports - Imaan and Camilla taught nursery rhymes to Reception whilst Mrs Leroy and I did the journey to school with Year 2. I found it difficult to teach in the heat and my methods of control weren't the same as the class teacher (who was a little more forceful than we are used to). We also took pictures of the kids in the Liverpool football kit which went down a treat. 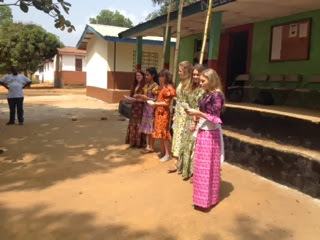 Mrs Leroy and Miss Smith report: we were moved to see how happy the 14 orphans were. We showered them with toys, clothes, shoes, sweets and whoopi cushions!!! Mr Power also brought donations from from his church and an anonymous donor. The underwear donated by Stanfield children was really needed and the children distributed it fairly. The knitted teddies donated fly Parenting 2000 in Southport, were gratefully received. We were all humbled by Mr Sow and his work - the children were ambitious, polite and charming! Mrs Robinson says- we reclaimed some tables and chairs and books from the CODEP library which was still in some disarray, but Mr Sandi and Nelson Mandela were thrilled and said that God had visited them again. -thanks to Claire Curtis Thomas. And - Finally Mr Power adds that he is so proud of everyone involved in the trip. To hear the voices of MTGS pupils streaming out of the windows of the new classrooms at Nelson Mandela High School has been a dream in the planning for many years! 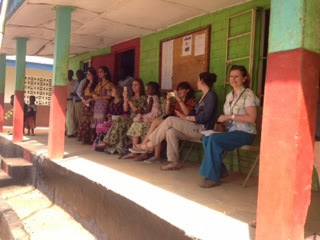 It was quite emotional to hear Corinne, Katy and Cat working with the pupils and staff. We are having a great time!!! Day 4 - Church, Lunch and Beach!!! What a fantastic day we have had!! The girls and staff chose which of the church services they wished to attend, accompanied by the staff at Hope Prep, Nelson Mandela and the Chairman of the Waterloo Partnership's wife Aminata. The long services were broken up by some very energetic singing and our participation (Mr Power read the readings at St Raphael's and the girls read the First and Second readings at Fannyann's church. At the offertory, we took our religious books to be blessed and we were thanked profusely for attending and helping the community of Waterloo. We the had a lovely lunch at Fannyann's (after Mr Power and Mrs Robinson went and met with Mr Sandi's church officials) - rice, vegetables and ??? never tasted so good. Then a lovely few hours on Mama Beach where everyone dipped their toes into the Atlantic which was so refreshing. The girls played with Fannyann’s relatives, braided hair, watched with fascination the signal crabs and generally relaxed. The journey home, on the Peninsula Road - which is half completed - didn't allow anyone to sleep, but a lovely convivial evening meal ended a most enjoyable Sunday! Day 3 - Dresses and Sports Day!! Saturday: from Mrs Robinson's view! What a difference 4 years make and how positive the relationships are now. Fannyann took the girls to be measured for their traditional dress and then the famous slaves' beach, after which we had a much enjoyed drink. Sports day was as every other sports day at any school - organised chaos which was much enjoyed by all. The houses have been renamed as John Power (green) Rick Walker (blue) and Louis Robinson (White)! The tug of war was renamed the tug of peace and the egg and spoon race like any other egg and spoon race, which our girls joined in, but the other competing girls ate their egg after the race. In the 100m, Katy, Cat and Corinne entered as well and Miss Jones would have been very proud - Corinne won! Mrs B Jones had dyed all the Tshirts and would have been v pleased to see them! !A Good Day and ready for something to eat now! Today saw us making our way through the capital city to reach our partnership schools. The normal mountain road has been closed and it will now take a 4 hour round trip to our schools. 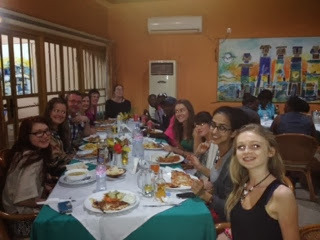 However, it is a good chance to see the sights of Freetown and the surrounding areas. We arrived at Nelson Mandela High School to open the new school building. The Chairman of the Waterloo Partnership began the proceedings and the school was blessed by Christian and Muslim leaders. Representatives and elders from the local community also have addresses. Mrs Robinson and Mr Power thanked the various assembled and the school was officially opened. Mr Power and Mr Sandi held the ribbon as Mrs Robinson cut it to declare the Madiba Centre for Learning open!! The local community of York Road surprised Mr Power by naming him Honorary Chief... full title in school please.... Chief Pa Kombabah John Power. The girls met so many pupils and made new friends before setting off to see the little ones at Hope Prep. When we arrived at the school it was eerily quiet. When we made our way through the school grounds we turned corner after corner until we found all of the all of the children assembled. We sang, danced, played games and we all gave a roaring rendition of Shine Jesus Shine!!! (with clapping!!). Mrs Robinson thanked the school for their welcome as each of us was presented with our valentine rose!! We finished the day at the Waterloo Partnership Womens Tools and Seeds Project. We saw how the women grow crops from potatoes to chillis and again the girls made new friends with the local children. It is now very late - I am off to bed - hopefully one of the 6th form will do the blog tomorrow. As promised I will give a special mention to my form - 11T. Your donations paid for a new uniform for Abdul Bangura and Nelson Mandela High School. Happy Birthday Hollie!! 7 days to go - cases getting full!